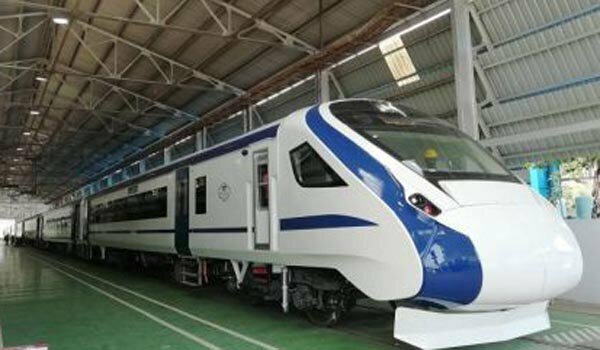 Prayagraj: Planned to run between New Delhi and Varanasi, the nation's first semi-high speed T-18 Express train, reached the Allahabad Junction on Saturday morning.The Public Relations Officer of the Allahabad division Sunil Kumar Gupta said here that the train was earlier slated to run on December 25-the birth anniversary of former prime minister late Atal Bihari Vajpayee, but the trial could not be conducted and was postponed. The train will run on a stretch between National Capital and Varanasi?the parliamentary constituency of the Prime Minister. The PRO informed that the train departed from New Delhi at 0055 hrs and reached Allahabad station on 0748 hrs against the scheduled 0720 hrs.Mr Gupta said that the train will leave Allahabad Junction at 1400 hrs and will reach Kanpur Central station at around 1558 hrs. After a two-minute stoppage, the train will leave Kanpur station at 1600 hrs and is expected to reach New Delhi station at 2025 hrs.While on its way from New Delhi, the train was given a two-minute stoppage on Kanpur central station.